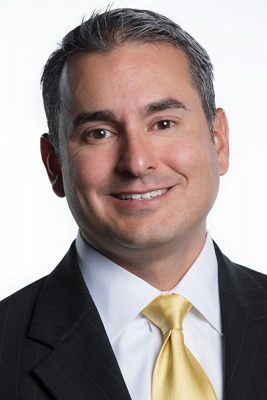 Gabe Castro has been with TXU Energy for twenty years. The vice president of business for Texas’s premier energy company says he’s stayed committed to the company because of the character, quality, and competitive nature of the people he works with. Not to mention, he has always found the business itself endlessly fascinating. Texas is one of a handful of states where the generation and sale of power is deregulated and handled by private businesses in an open market. Castro says the unique business environment means the company has to work extra hard to distinguish itself and grow its customer base. In states where the business is still fully regulated, customers are given a month-to-month rate by the utility company, with no choice to look elsewhere. In Texas, on the other hand, you can shop around and choose your provider. You can ask to lock in prices for multiple-year terms, or choose to float with the market with whomever you wish. Castro says that the company is going up against over one hundred different competitors every day. The Texas power market is determined by the price of natural gas, because most of the plants that generate power use natural gas. It is an extremely volatile commodity; the price changes every fifteen minutes based upon a number of factors including weather, supply, and demand. In Texas, an early afternoon in July, for example, brings the highest demand and consequent price: air conditioning is cooling homes and office buildings across the sweltering state. Yet at 2 a.m., the relative cool of the morning hours requires less demand and much lower cost as a result. That led TXU Energy to offer “TXU Energy Free Nights,” the first company to do so. Through smart meters, Castro and his team are able to analyze a customer’s power usage and offer a price structure that better fits the needs of a specific customer. The analytics also give them the ability to send warnings to users when they are using more power than usual. The energy industry is being revolutionized by the surge of green alternatives in power sourcing, which are on the path to becoming as cost-effective as conventional fuel sources. “If you go back a few years, wind and solar generation were viewed as interesting, but it stopped there. The economics at the time made it challenging for customers to pursue,” Castro explains. “But now they are here, they are credible resources, and they are economically feasible resources.” In Texas, a solar panel is now comparative to the price of power produced from conventional sources, and it may soon surpass conventional power in efficiency. “Now we can come to the table with a company and say, ‘I have a solution for you that will give you budget and price certainty, and I can also make it green,’” he adds. Looking ahead, the parity of alternative energy sources with conventional, along with predictive and mobile technologies, is going to drive the market, Castro says. In the meantime, his challenge with TXU Energy is to stay ahead of the competition in a wide-open field that is undergoing major transformations. The 534 megawatts of solar energy currently installed in Texas ranks the state tenth in the country in installed solar capacity. There is enough solar energy installed in the state to power 57,000 homes. Texas ranks #1 in the nation for wind energy capacity and biodiesel production. Texas is by far the leading state in wind energy generation with 12,214 megawatts of installed capacity—enough to power over 3.3 million homes. Renewable sources account for more than 8% of all energy consumed in Texas. In 2015, $372 million was invested on solar installations in Texas. This represents a 48% increase over the previous year, and is expected to grow again this year.